Higher energy and endurance levels. 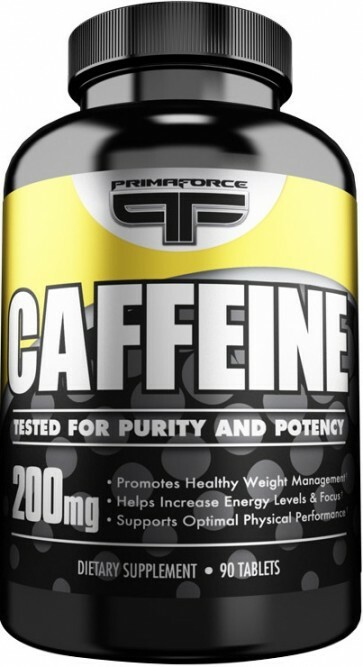 200 mg ultra-pure caffeine in a single capsule. PRIMAFORCE Caffeine contains ultra-pure anhydrous caffeine. The product stimulates the organism to increased physical and mental activity in an extremely rapid manner. Caffeine not only stimulates the central nervous system, but it also helps to overcome tiredness and workout-related stagnation. This active alkaloid reduces the decomposition of glycogen and increases the metabolism of fat, thus increasing the amount of energy, which is required for truly demanding exercise. The addition of naringenin increases the effect of caffeine and prolongs its activity in the organism.